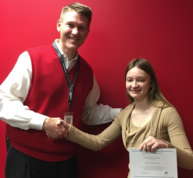 Pony E-News: National Merit Finalists, state champion wrestler and classroom becomes a fishery! Stillwater Area High School students Jacob Kosyakovsky and Marta Markowicz have been named National Merit Finalists. Each year 1.6 million students apply, but only one percent of them are accepted as finalists. Jacob and Marta are among just 16,000 high school students who will be vying for $33 million in scholarships. Wrestler Reid Ballantyne captured the Class 3A, 106-pound state title! The eighth grader is Stillwater's first state champ since 2003. He had a perfect 45-0 record this season. Seniors James Huntley (182 pounds) and Connor Weiss (195 pounds) both placed fourth at state. Read more. The boys swim and diving team placed 4th at the state meet. The gymnastics team placed 5th overall at state. Congratulations to the 66 Stillwater Band musicians who participated in the Region 4AA MSHSL Solo/Ensemble Festival. Our Stillwater Band musicians excelled with 40 superior ratings, 15 Excellent Ratings and 5 Best of Site awards. Read more. The SAHS robotics team spent six weeks building and perfecting their robot for this year’s First Robotics nationwide competition. The team will randomly be paired up with two other teams to battle with area schools in the 10,000 Lakes Regional competition. The event will take place at the University of Minnesota’s Williams Arena April 6-8. The winning alliance goes to the national competition and the top 30 teams go to state. See more pictures on our Facebook page. There's something "fishy" going on at Lake Elmo Elementary! Fifth graders have turned their classroom into a trout hatchery. The school is one of just 18 others participating in the watershed learning project thanks to a grant from the nonprofit Minnesota Trout Unlimited. Read more. The entire Class of 2025 went to Orchestra Hall thanks to a grant from The Partnership Plan. Each year fourth grade students are given the field trip as an inspiration before they choose an instrument to play the following year. More than 620 fourth graders went on this trip this year. Want to help make these amazing experiences possible while having fun at the same time? Attend The Partnership Plan fundraiser, the Partnership Party, on March 11! Sign up online. Notice is hereby given that the school board has canceled the closed session for negotiations. The session was scheduled to be held after their business meeting on Thursday, March 9 at Stillwater City Hall, 216 North Fourth Street, Stillwater, MN.